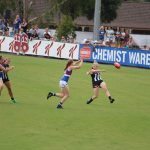 THE premiers of the Victorian Football League (VFL) Women’s competition were one of the in-form teams throughout the season. The Hawks scraped through for some close wins while also showing their dominance with some big victories. The skipper led from the front in marvellous fashion this season, putting her body on the line and proving to be an inside bull. Mackie’s football smarts partnered with her power gave opposition midfielders headaches, as she was able to move the ball swiftly through the midfield. Mackie had a cracking game in Round 3 against the Blues, racking up 29 disposals, taking four marks, laying 11 tackles and kicking a goal. The Lisa Hardeman medalist was a standout all season, with coach, Patrick Hill trusting her to shut down dangerous opposition forwards The former basketballer showed her agility in defensive 50, taking athletic marks and showcasing her exciting run and carry. Perera placed fifth in Hawthorn’s Best and Fairest count. The Greater Western Sydney (GWS) star was a ball magnet this season, consistently racking up high numbers of disposals. Beeson had the ability to float up forward and also dominate in the midfield, proving to be a highly versatile player for the Hawks. Her kicking and handballing was fantastic and she always endeavoured to go forward with the ball in hand. Beeson placed second in Hawthorn’s Best and Fairest count. She starred in Round 15 with 30 disposals, eight marks and three tackles. 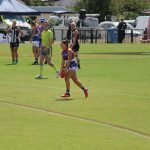 The heart and soul of female football was a joy to watch this season, proving that despite retiring from AFL Women’s, she can still play the game very well. Hutchins was dominant in the back line, taking plenty of intercept marks and getting her side out of trouble on multiple occasions. She could shut down key players or play as a loose player, and could succeed in both roles. 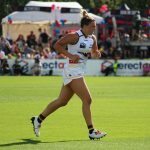 Hutchins came third in Hawthorn’s Best and Fairest count and stood out in Round 7, when she racked up 19 disposals and took five marks. A deserved Hawthorn Best and Fairest winner, Jayde Van Dyk was an absolute star in the backline. Van Dyk impressed with her football smarts and agility, combining them both to use the ball well both by hand or by foot. 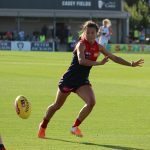 The VFLW Rising Star could stop key players in their tracks and used her run and carry to effect multiple times this season. She led the way in Round 8 when she gathered 26 disposals, six marks and nine tackles against the Tigers. 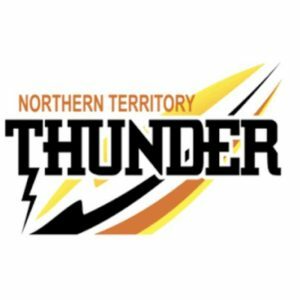 The premiers didn’t do much wrong this season, only dropping two games. Among the 12 wins, Hawthorn experienced some real character-building wins, with seven of those wins being under 10 points. This showed the Hawks’ composure and resilience to get the win, making them deserved premiers of the VFLW. HAWTHORN’S Victorian Football League (VFL) Women’s side claimed the premiership on the weekend with a hard-fought victory over Geelong at Etihad Stadium. We took note of some of the impressive players on the day. Went for a ride on Anna Teague on the wing but was pinged for unrealistic attempt. Then had a crack with a clever snap on goal which bounced past three running Geelong defenders, before unluckily bouncing into the post. Made her chance count when she got another one in the second term with an attempt off a step and kicked it through the middle to hand Hawthorn an 11-point lead in the 13th minute. With Geelong attacking early with momentum, it was Perera’s tackle on a Geelong opponent that earned an important free kick and rebound down the other end. Then had another impressive defensive moment with an intercept mark then pass to Pepa Randall who found a target inside 50. Her drive off half-back and ability to take the game on earned her Best on Ground honours. Kept her feet in a one-on-one contest and gained some vital meterage for her team going forward. Did a lot of work that might have gone unnoticed on the stats sheet, but really contributed to the on-ball brigade. Good one-one one mark just inside 50, then delivered the ball on a platter to Tamara Luke leading out from the square. Had a golden chance from 15 metres out in the second term almost identical to Clifford in the first term, and McWilliams also missed. She started to have a real impact in the second despite the miss, leading out and taking another strong mark then kicking to the danger zone 20 metres out from goal. Had a chance in the fourth quarter and decided to pass it off but it fell short. Worked hard at the coal face with a big opening term, collecting five disposals and laying a tackle. Cracked in hard and won a one-on-one contest in the second term on the wing. Beeson led all-comers by half-time with 11 disposals and three tackles to be a key reason why the Hawks were on top. Almost bit off more than she could chew on the wing but got out of the tackle. Won a holding the ball free against Nina Morrison on the wing. Massive cheer rang out across the Hawks’ defensive end when Nixon cleanly picked up a ball and kicked to a teammate on defensive 50 to stop a potential Geelong goal. Just attacked the contested hard and showed cleanliness at ground level. Could not quite keep it in on the wing early in the game, but buried herself at any contest she could throughout the opening stanza. Had a shot on goal in the second term from the set shot but it fell short and was rushed across the line. Always busy around the stoppages. Made her presence felt early, stopping Maddy McMahon from running into the 50 with a front on bump. Then delivered a lovely ball inside 50 to a teammate on the lead. Took a strong grab in the middle intercepting to send it back inside 50. Took a strong one-on-one mark leading out and converted the set shot. Impressive second term saw Luke win a number of free kicks for getting to the ball first. Sold a bit of candy at half-forward to kick inside 50 and force a stoppage. A rock in the back half, was quiet early, but had a good kick in the second term along the wing. Drifted forward and then had a quick snap which missed. Headed back down the other end and then took a big intercept mark on the last line. Showed good power to dash off half-back and kick long along the wing. Stood tall with a strong intercept mark off a Nina Morrison kick going inside 50. Had an early shot on goal from a quick snap, which went through for a behind. Had a second chance off a split second, missing the shot as she was pushed down and it went out on the full in the second quarter. Got the Hawthorn faithful up and about with a snap 15 metres out after juggling the mark, playing on and kicking around her body – was the first Hawthorn inside 50. Big grab in defence to intercept and clear to the defensive 50 in the final term with the game on the line. Won a free kick for copping head-high contact at ground level inside 50, showing courage. Had a set shot from 30 metres out which nailed the game and put it beyond doubt with seven minutes remaining in the final term. Goal-saving tackle one-on-one on her opponent, Michele Fedele when she was running into an open 50 and the bounce went astray. Unbelievable chase and stopped a certain goal. Laid another strong tackle just out from goal when her opponent tried to turn around and Van Dyk wrapped her up. A terrific effort in the third term when Geelong was doing all the attacking, standing up strong and kicking clear, while taking a number of marks. Won a free kick for being held after going in for the ball at half-back when Geelong was attacking and kicked along the wing. Forced a ball-in on the wing with a big grab. Took a really strong intercept grab at half-forward, then showed off her tackling prowess late in the first term with a massive tackle to force a throw-in inside the Hawks forward 50. Just attacks the contest and does not take a backwards step. Provided a big front on bump to Ellie MacDonald in the first term, but helped her opponent up in a show of good spirit. Had a few nice touches on the wing. Continued showing her physicality with a strong tackle on the wing. Fell into the hole and took a good uncontested grab, but like so many others, missed the chance with the wind from the doors being opened at the Lockett end pushing it to the left. Had a chance to kick an early goal in the second term but just missed and it was knocked across the line for a behind. Showed courage in the last term sliding in to mark the ball and copped front on contact. Showed great defensive pressure on her opponents early, laying an important tackle 15 metres out and then slotting the set shot with a neat stab kick. Took what looked to be a strong mark on the 50 but it was not paid. Used her body well. Took a huge grab at the top of the square, but missed from 20 metres out. Had a chance in the third term but was rushed across the line for another behind. Gave Mia-Rae Clifford silver service after winning a free and then delivering her kick inside 50 on a platter to Clifford, who unfortunately missed the set shot. Was unlucky not to be paid a mark in the second term on the wing, and then Hawthorn cleared it, leading to a Phoebe McWilliams goal. Won a free kick in a forward ruck contest for being pushed in the back, but missed her attempt. Nailed her third chance in the final term, taking a mark under a high ball and kicking truly. Won an important one-on-one clearance and got her hands on the ball early. 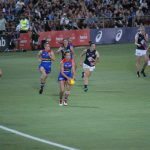 She was the equal highest disposal winner on the ground at quarter time with six, firing out five handballs to teammates outside the stoppage. Massive on the inside throughout the game, not only winning the ball but laying 10 tackles. Really important on the inside just getting to the right positions and giving it off cleanly to teammates on the outside. Looked all class in the first term when she spun around and fired out a handball to a teammate in traffic in forward 50. Morrison was putting good defensive pressure on her opponents, spending time on the more experienced Meg Hutchins at times. Just kept winning the football with important touches, racking up 10 disposals by half-time, and also laying three tackles. Won a hardball at a contest in the third term at half-forward then kicked inside 50. Morrison had a massive impact in the final term and continued to rack up the ball at will with some big inside 50s. Copped a big front-on bump early in the first term but bounced straight back up and was one of the Cats’ best with six touches (four kicks) in the quarter. Had another big moment in the final term with a nice kick inside 50 to the the hot spot early which resulted in a Kate Darby goal. Almost kicked a miracle goal from 50 metres around her body but the ball bounced up and was taken away. Fended off an opponent in the second term and kicked forward, got more involved with a couple of powerful kicks to try and inspire her team. Showed courage and strength at ground level in the first term to go in hard while protecting herself to pick up a contested ball and hold it up. Had a big first half, often kicking out of defence with nine kicks from 10 disposals and mopping up for the Cats.